Purdue researchers say spinach holds promise as alternative energy fuel; Stanford team says it has achieved the ‘holy grail’ of battery design in its stable lithium anode, which could lead to more efficient rechargeable batteries. According to physicists at Purdue University, spinach holds the promise of being able to convert sunlight into a clean, efficient alternative fuel. The Purdue team is part of an international group using spinach to study the proteins involved in photosynthesis, the process by which plants convert the sun’s energy into carbohydrates used to power cellular processes. During photosynthesis, plants use solar energy to convert carbon dioxide and water into hydrogen-storing carbohydrates and oxygen, and artificial photosynthesis could allow for the conversion of solar energy into renewable, environmentally friendly hydrogen-based fuels. In the lab, a protein complex called Photosystem II is extracted from spinach they buy at the supermarket in a complicated process performed over two days, in a specially built room that keeps the spinach samples cold and shielded from light, she said. Once the proteins have been extracted, the team excites them with a laser and records changes in the electron configuration of their molecules. The proteins need light to work, and the laser acts as the sun in the experiment. Once the proteins start working, advanced techniques like electron paramagnetic resonance and X-ray spectroscopy are used to observe how the electronic structure of the molecules change over time as they perform their functions. 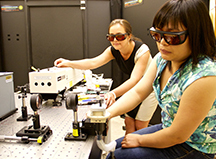 Purdue physics professor Yulia Pushkar (left) and postdoctoral researcher Lifen Yan work in Pushkar’s laser lab. Pushkar and Yan are part of an international team using spinach to study the proteins involved in photosynthesis. In designing a pure lithium anode, researchers at Stanford University report they have taken a big step toward completing what battery designers have been trying to do for decades. This development could lead to smaller, cheaper and more efficient rechargeable batteries in the race to meet the power storage needs of everything from handheld gadgets to electric cars. All batteries have three basic components: an electrolyte to provide electrons, an anode to discharge those electrons and a cathode to receive them. Today, we say we have lithium batteries, the Stanford team pointed out, but that is only partly true: What we have are lithium ion batteries. The lithium is in the electrolyte but not in the anode. An anode of pure lithium would be a huge boost to battery efficiency. Of all the materials that could be used in an anode, lithium has the greatest potential, which is why some call it the Holy Grail since it is very lightweight and has the highest energy density. It gives more power per volume and weight, leading to lighter, smaller batteries with more power. Engineers have long tried and failed to reach this Holy Grail because lithium has major challenges that have made its use in anodes difficult. Many engineers had given up the search, but the team found a way to protect the lithium from the problems that have plagued it for so long. The research team includes Steven Chu, the former U.S. Secretary of Energy and Nobel Laureate who recently resumed his professorship at Stanford. “In practical terms, if we can triple the energy density and simultaneously decrease the cost four-fold, that would be very exciting. We would have a cell phone with triple the battery life and an electric vehicle with a 300 mile range that cost $25,000 – and with better performance than an internal combustion engine car getting 40 mpg,” Chu said in a news release.